Does choosing the perfect paint color for your Loft feel a little bit like finding Bigfoot – mythical and elusive? Do you stare at the racks and racks of paint chips at the hardware store and break out into a cold sweat? Are you worried that you’re going to pick a color, paint the walls and end up hating it? Don’t worry – we’ve all been there. Color can have a big impact on the feel of a room, so it can be a little intimidating if you feel like you don’t know what you’re doing. Here are some pointers to get you started and to ensure you’ll have a finished product that you love. Do you have a favorite throw pillow? Did you happen across a picture in a magazine that speaks to you? Maybe you have a dress that makes you feel really special every time you wear it. Chances are, the colors in those pieces have a lot to do with why you’re drawn to them, so why not use them as inspiration? Choose a color or two from the palette and go from there. In fact, Sherwin Williams has a great online tool called Snap It that lets you turn any online image into a personalized paint palette so you can easily match the colors at the store. If you’re new to the color game, then it’s probably not the best idea to dive in by painting your biggest room first. Why not practice on a smaller space? Give your powder room, a hallway or even a closet a makeover with a fresh coat of paint. You’ll have a better idea of how certain colors affect the feeling of a space and how the light in the room can change the color depending on the time of day. 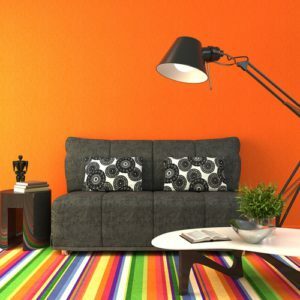 There’s no denying that color and mood go hand and hand, so think about the mood you want to create in a room when you choose what color to paint the walls. Do you want to evoke a cozy feeling in the bedroom? Maybe you want the foyer to be bright and cheerful? Do you want people to feel sociable in your dining room? Choose colors for those rooms that evoke the feeling you’re hoping to create. If there are aspects of the room you cannot change – for example, that beautiful wooden heirloom dining table from grandma or the custom slate tile in your bathroom – make sure you take those existing colors and finishes into account when choosing your paint colors. Let these pieces help guide you in your choices so that the room is coordinated once its complete. If choosing new paint colors is stressing you out, remember – white is a perfectly acceptable color that goes with everything. It’s absolutely okay to skip the endless deliberations and go with something classic and easy. Sometimes the best way to add color is through furnishings such as pillows and throw rugs, which require less work and commitment.